In a Wednesday speech in the White House's Roosevelt Room, President Trump endorsed a bill which would reform immigration in the United States by creating a more competitive visa-approval system aimed at scaling back the number of immigrants entering the country. Mr. Trump described the bill as "legislation that would represent the most significant reform to our immigration system in half a century." The Reforming American Immigration for a Strong Economy (RAISE) bill, introduced by Sens. Tom Cotton, R-Arkansas, and David Perdue, R-Georgia, establishes a "points-based system for acquiring a green card," according to Mr. Trump, while also preventing immigrants from collecting welfare once they arrive in the United States. "The RAISE Act will reduce poverty, increase wages and save taxpayers billions and billions of dollars," Mr. Trump said. The bill aims to make the U.S. immigration system more competitive through rewarding immigrants who speak English, have financial stability and demonstrate useful skills, among other factors relevant to the merit-based system. It would also end chain migration in the green card application process by only extending to immediate family, such as minor children and spouses. Finally, the legislation would limit the number of refugees permitted to enter the country and eliminate the visa lottery, which makes 55,000 Permanent Resident cards available every year to immigrants from "underrepresented countries," according to the Department of Labor. If the bill is passed, those seeking entry into the country may either apply for the narrow family-based immigration category, or may compete in the points-based application process. Ultimately, the bill would significantly reduce the number of immigrants, including refugees, entering the United States. "This legislation demonstrates our passion for struggling American families," Mr. Trump said, adding that the change in immigration policy "puts America first." The president asserted that the current immigration system "has not been fair to our people, to our citizens, to our workers," and that he hopes the proposed bill will protect U.S. workers from being displaced by reducing the number of unskilled immigrants coming to the United States. "The reforms in the RAISE Act will help ensure that newcomers to our wonderful country will be assimilated, will succeed and will achieve the American dream," Mr. Trump said. Perdue compared the bill's immigration plan to those in place in Australia and Canada, adding that the current immigration system in the United States prevents the country from being a successful economic power on the world stage. "What we're talking about today is very simple: it's measured, it's a rational approach to immigration that will allow us to finally fix, once and for all, this broken system in a strategic way that will reposition America as a global leader economically," Perdue said. Cotton described the current system for those hoping to enter the United States as "an obsolete disaster." A statement released by Cotton's office explains that the legislation "would spur economic growth and raise working Americans' wages by giving priority to the best-skilled immigrants from around the world and reducing overall immigration by half." In a speech delivered by the president last week during a rally in Youngstown, Ohio, Mr. Trump referenced the bill and his hopes to reform immigration. 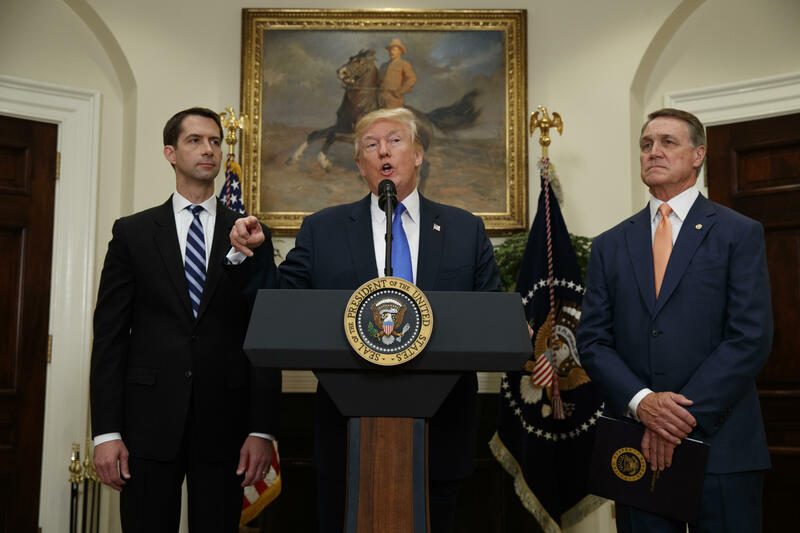 "As we speak, we are working with two wonderful senators, Tom Cotton and David Purdue, to create a new immigration system for America," Mr. Trump said. "Instead of today's low-skill system, just a terrible system where anybody comes in. People that have never worked, people that are criminals, anybody comes in. We want a merit-based system. One that protects workers our workers, our taxpayers, and one that protects our economy."